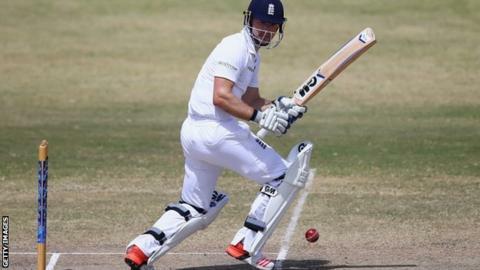 Uncapped Yorkshire opener Adam Lyth is set to make his England debut after being named in the squad for the first Test against New Zealand at Lord's. He replaces the retired Jonathan Trott as Alastair Cook's opening partner. The 12-man squad includes 10 of the 11 players who played the last two Tests against West Indies. Durham paceman Mark Wood, also uncapped, will compete for a place in the bowling attack at Lord's when the series begins on Thursday, 21 May. "I can't wait to walk out with AC at Lord's next Thursday," Lyth, 27, told BBC Radio 5 live. "It will be the proudest moment of my life. "I'm sure there will be quite a few nerves on the Wednesday night and on the morning of the game, but hopefully I can control them and get some runs in front of a packed house." National selector James Whitaker said Lyth "fully deserves his chance", adding that Wood, 25, had "also impressed". Lyth will become the 666th man to play Test cricket for England. That number, 666 - supposedly associated with the Devil - will appear on his playing shirt for the rest of his career. He will be given the option to skip to 667 but has said he will take "any Test number". Other evidence lists the "number of the beast" as 616. England's 616th Test cricketer was seamer James Kirtley. "His pace and style of bowling ensure the coach and captain have options in the bowling attack," said Whitaker. Lyth and Wood were both in England's squad for the recent Tests in the Caribbean but did not play. Pace bowler Liam Plunkett, who also toured the West Indies without playing a Test, may have been in contention for the Lord's squad but missed the chance to impress for Yorkshire when he was dropped from this week's game against Hampshire for a breach of team discipline. England - with assistant coach Paul Farbrace in temporary charge, following the sacking of Peter Moores - will face the Black Caps, captained by Brendon McCullum, in two Tests, with the second match at Headingley on 29 May. Meanwhile, New Zealand coach Mike Hesson confirmed that the arrival of batsman Kane Williamson will be delayed after he was forced to remain with his Indian Premier League side Sunrisers Hyderabad. The tourists had hoped that Williamson would be released early to travel to the UK, but an injury to fellow Sunrisers batsman Kevin Pietersen has prevented that. Williamson is still expected to arrive in time to play in the first Test. England squad for first Test v New Zealand: Alastair Cook (Essex, capt), Adam Lyth, Gary Ballance (both Yorkshire), Ian Bell (Warwickshire), Joe Root (Yorkshire), Moeen Ali (Worcestershire), Ben Stokes (Durham), Jos Buttler (Lancashire, wk), Chris Jordan (Sussex), Stuart Broad (Nottinghamshire), James Anderson (Lancashire), Mark Wood (Durham).